I’ll admit my Boys Before Flowers fatigue kicked in about eight episodes ago — that’s when it started being more fun writing about the drama than actually watching, and let’s face it, it’s always more fun the other way around (the balance did swing back in the other direction in the past couple episodes, so yay!). The flashback montages brought back some nostalgia, and made me feel the tiniest twinge of sadness to be saying goodbye to this drama soon, craziness and all. Jun-pyo pleads for Jan-di to tell him not to get married. She doesn’t respond and is called away by an usher saying Jae-kyung is asking for Jan-di, so she leaves without a word. However, from her expression — upset, frustrated — we can see she’s not going to beg Jun-pyo to call the wedding off. He registers this too, to his disappointment. F3 share Jun-pyo’s letdown — from their chagrin here and the way they were willing to let him break his own arm, it’s obvious they hoped Jan-di could put a stop to this. Meanwhile, the guests wait outside, growing fidgety the longer they are kept waiting, while Jae-kyung sits in her bridal chamber nervously. Jan-di is led away by the attendant to meet Jae-kyung, but finds herself kidnapped instead — she’s grabbed by one guy and shoved into an elevator with several more. Mama Kang then sends Jun-pyo — still wrestling with his dilemma in the waiting room — a text message with a simple warning: a photo of Jan-di being restrained is accompanied by the words, “The groom is taking too long.” Her implication is clear: If Jun-pyo doesn’t go through with the wedding, Jan-di will come to some kind of harm. 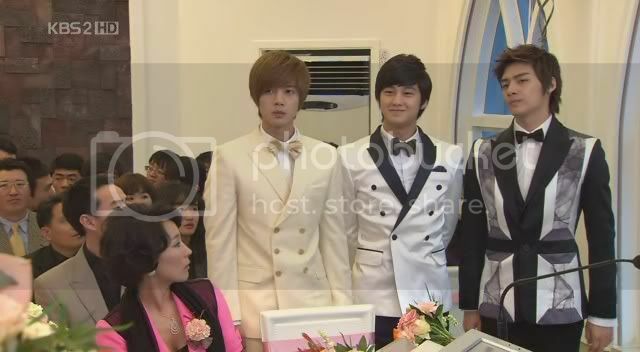 Therefore, she smiles smugly when the groomsmen enter the chapel, followed by (a very tense) Jun-pyo. Next comes the bride, who takes her place by Jun-pyo at the altar. The minister begins the ceremony, breezing through the opening. When he gets to the part where he asks for any objectors to speak now or forever hold their peace, he isn’t expecting a response and is therefore startled when Jae-kyung raises a hand to get his attention. The parents are stunned; her father tries to hiss out a warning to her, but Jae-kyung says that she has an objection. She looks around and guesses that there must be others who also have objections, at which point Ji-hoo stands up, followed immediately by Yi-jung, Woo-bin, and Ga-eul. Tamping down her anger, Madam Kang walks out, followed by the rest of the guests. Confused, Jun-pyo asks Jae-kyung what she’s doing, which she answers with a simple explanation: “I’ve always been a pretty cool person.” Jae-kyung calls her bodyguard Chen to check in on Jan-di, who has been liberated from her kidnappers and is taken to a yacht. 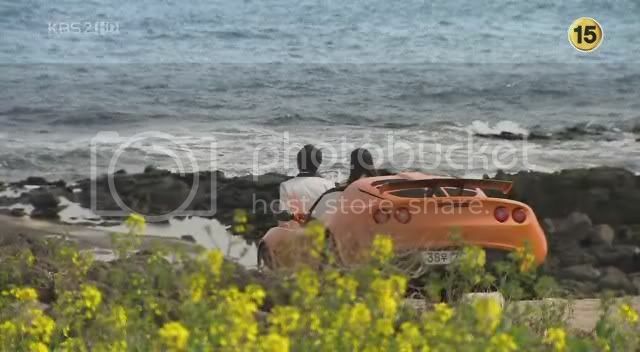 Freed from his obligation, Jun-pyo dashes out of the chapel to the yacht, where he finds a surprised Jan-di waiting alone. He grabs her in a relieved hug, and I can’t help thinking she doesn’t deserve this, seeing as how she put up no fight and hasn’t really earned his devotion. Still, the key to enjoying what follows is to accept their happy reunion, so I’m doing my best to let this point go. The yacht sets sail, and from a distance (her hotel room, perhaps), Jun-hee watches, pleased at this turnout. Yi-jung drives Ga-eul out to the shoreline, amused at her uncontrollable sobbing — Ga-eul has been overwhelmed with emotion at Jae-kyung’s lovely gesture. This spins us into a flashback: Three years ago, he had walked into his studio, flirting with a couple girls, and found Eun-jae waiting. Much like Ga-eul had reacted in a similar scenario (and the similarity must be intentional), Eun-jae had been flustered, accidentally breaking a pot and cutting her finger in her haste to leave. Yi-jung had chased her outside and asked what she had to say. She’d said, “I have a favor to ask” — but we don’t get to see the rest of this scene so we’ll have to wait to find out. Ruefully, she tells him, “I was rooting for you, but I’d hate to have given up for nothing, so I can’t do that anymore.” She mentions how she’d asked Jun-pyo whether he would choose friendship or love, and he had answered that he wouldn’t give up either. Ji-hoo smiles a bit at that, because it’s a reminder that Jun-pyo is still committed to being his friend. She wishes him luck, and leaves. Jan-di and Jun-pyo arrive at a villa, which has been lavishly decked out in a romantic display — candles, fancy food, rose petals arranged in a heart configuration. (I believe Jae-kyung has handled the arrangements.) Their initial reaction is to sneak looks at each other uncomfortably, as though embarrassed with the overt romanticism. As Jan-di looks through a telescope at the stars, Jun-pyo points out Sirius, known as Orion’s dog (part of the Canis Major constellation) and the brightest star in the night sky. He jokes that it’s like him in that respect, so Jan-di laughs and claims a star for her own. Jun-pyo identifies it as Procyon, the brightest star in Canis Minor. Jan-di asks how he came to like astronomy, at which he suddenly grows quieter. When he had been younger, his father had sent him a telescope with a card telling him to study the stars, so that they could watch them together later. Jan-di guesses that his interest stemmed from father-son star-watching dates, but he says no — they never went. Believing that promise, Young Jun-pyo had studied his hardest. You know, all the lovey-doveyness is pretty much expected stuff, but the whole thing really brings a smile to my face. I’m just so glad to see everyone looking happy for once (even if the actors, poor things, look visibly exhausted). This giddy vibe continues the next day, when our happy couple relaxes together. They’re visited by their friends, who are likewise relieved to see that all is well in the land of Jun-di love. Ji-hoo is glad that Jan-di is once again able to laugh, and tells her so. He also hands over her the lost star-moon necklace, and although it’s crossed his mind that it’s suspicious that Jae-kyung had it all this time, that’s all moot now. Instead, Jan-di is alarmed that Jae-kyung is about to depart any minute now and rushes off for the airport. Although Jae-kyung more or less steamrollered Jan-di into their friendship, Jan-di has developed an affection for her, and a part of her feels guilty for taking away the man Jae-kyung loved. They make it just in time to catch Jae-kyung before she boards — who, by the way, is looking around with a heavy heart, as though half-hoping that they would come to see her off even though she purposely didn’t tell them she was leaving. Jan-di scolds her for trying to go without saying goodbye, and Jae-kyung admits that she doesn’t handle them very well. With some affection, Jun-pyo tells Jae-kyung to take care, and thanks her. The two ladies hug, Jan-di openly crying and Jae-kyung holding her tears back. She rushes off before she succumbs to tears, and boards the plane. And then, everyone’s back home. As punishment for the broken engagement, Madam Kang has ordered her men to keep Jun-pyo confined to his room, where he sees the news reports speculating on the uncertain future of Shinhwa’s merger with JK Group. As for Jan-di, she’s once again homeless, knowing that she’d better get out of Gu Manor ASAP, before Madam Kang acts. Once again, Witch Mom beats Jan-di to the punch, arriving at the restaurant to deliver Jan-di’s luggage. She is in a high temper, and accuses Jan-di of being even more sneaky than she’d given her credit for, acting innocent and then pulling off a sly move behind everyone’s back. Even for Madam Kang, the accusations are pretty strong, but we see why: she shows Jan-di a newspaper announcing that the merger, like the engagement, is off. This scene is interrupted by Grandpa Yoon, who rebukes Madam Kang for going too far. Although I doubt she feels sorry for her actions, Dr. Yoon’s presence has a chastening effect, and Mama Kang bows her head out of respect for him. And then, her temper is mollified entirely when Dr. Yoon announces that Jan-di’s business is his business because “she’s my grandson’s wife-to-be.” This is news to everyone, including Jan-di, but most of all Madam Kang. Ever the shrewd woman, she contains her surprise, quickly guessing that she need not interfere if Dr. Yoon’s words are true. Perhaps this is one battle she can win without even trying. Grandpa Yoon brings Jan-di home with him, turning the tables this time by pressuring her into staying. She and Ji-hoo both feel the awkwardness of the setup, but are overridden by Grandpa’s insistence that Jan-di remain with them. However! I do like this next turn, because Grandpa Yoon sits down with Ji-hoo to explain that Jan-di has nowhere to turn, and he wants to help her. Ji-hoo is about to explain that Jan-di might be uncomfortable here, but Grandpa pre-empts his argument. He says that Jan-di’s presence doesn’t have to mean anything. In fact, he’s opposed to Jan-di and Ji-hoo being together (I don’t think it’s a classist statement, but more that he thinks they’re not suitable together). Ji-hoo is startled, but smiles to himself — well, that potential problem worked itself out nicely. Now we see the rest of Yi-jung’s flashback explanation of why he never met up with Eun-jae. She’d handed him a letter and asked him to meet her the next morning, leaving with a hopeful smile. Yi-jung had walked back inside and put the letter on the counter to read later, but a phone call from his distraught mother had distracted him. He’d grown annoyed at her familiar histrionics and urged her to give up on his father, and when he ended the call and turned to serving his guests tea, his irritation caused him to spill tea on the counter. He’d tossed the papers that had gotten soaked, accidentally including Eun-jae’s unopened letter with the pile. Mr. Jung approaches Jan-di with a puzzling request, which Jan-di accepts sympathetically, happy to oblige. This is a favor he asks of her personally, which has nothing to do with Madam Kang or Jun-pyo — he’d like her to act as companion for a man in a coma. He’ll pay her for her sitting with the man and talking to him occasionally, as a part-time job. The man is described merely as someone “like family” to him. Jan-di is unsure why he’d ask this of her, but Mr. Jung explains that what the man needs is a warm spirit, and she’s the warmest person he knows. As Jun-pyo is currently under house arrest, he’s cut off from the outside world, and namely Jan-di. Woo-bin runs into her at school, and sighs over the rough patch they’re all going through right now — Yi-jung is still unable to use his right arm, and Jun-pyo’s locked up. Perhaps he’s even referencing the actors’ real-life haggard expressions, because he points to himself and says his face is suffering from all the worry. That last example makes her think of Ji-hoo (flashback montage! ), who’d always been there for her in her times of need, whether to lend her support or wipe away her tears. Jan-di smiles at her patient, saying she hopes to be a handkerchief type of person for him, too — and Mr. Jung watches from the doorway, pleased. This scene is a bit random, but at this point I’m just rollin’ with it. 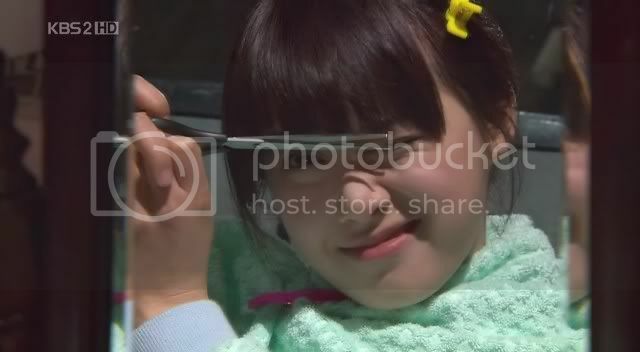 Jan-di struggles to cut her bangs satisfactorily, which is when Ji-hoo walks by and offers his assistance. Naturally he is a master of this skill — ain’t nothing he can’t do, is there? — and he finishes the job successfully. Jan-di returns the favor by volunteering to help wash his car (which, of course, eventually degenerates into a water fight). But when he looks over to see Jan-di’s reaction, he sighs because she’s fallen asleep and therefore hasn’t registered his indirect confession. He’s packing away his pottery items; she thinks it’s cowardly of him to quit so easily. He says in a dull monotone, “It doesn’t matter anymore.” She fires back, “It matters to me!” Ga-eul recites his own words back to him, harking back to his analogy likening a person’s heart to the clay-firing process. The clay, like people’s life experiences, is supposed to be strengthened by the fire. He dismisses it, saying, “I must’ve been talking crap.” Ga-eul isn’t willing to give up on him, though, and announces her intention to return to him the use of his paralyzed hand. In pursuit of that goal — like I said, it must have a psychological basis — over the next several nights, Ga-eul spends all her time going from building (apartment?) to building, working to the point of exhaustion. Woo-bin and Jun-pyo put their heads (and fists) together to devise a plan to slip away from his bodyguards. Jun-pyo heads out, feigning a careless attitude when he tells the bodyguards he doesn’t care if they follow him — he’s just going to be hanging out with Woo-bin. Of course they follow, trailing Woo-bin’s car on the road. They don’t count on Woo-bin’s mafia underlings cutting in out of nowhere, however, and find it impossible to continue their pursuit. And so, Jun-pyo earns an afternoon of freedom, and calls Jan-di out for a date. Unfortunately, she’s just assured a mother at the clinic that she’ll watch her young boy for the afternoon, and finds herself in a bind. Her compromise: she brings the boy along on the date. Jun-pyo is surprised (“What is that thing?”) and disgruntled that their precious time together is going to be usurped by this kid, and it’s adorable to see him try to deal with being left out. He pushes the boy aside a few times, wriggling his way between Jan-di and the kid to claim her attention (which is all done in fun). Eventually, he warms up to the boy as they spend the afternoon at the zoo. First of all, it’s worth pointing out that the scenery in recent episodes has been really beautiful. Perhaps this is one marked benefit of making a drama with unknown actors (or little-knowns) — you save money on acting fees to spend on location shoots, like in Macau, New Caledonia, and Jeju Island. I don’t have huge complaints with Jae-kyung’s exit from the drama, if only because I’m so glad she’s gone! I should be satisfied with that and not look the gift horse in the mouth, so to speak. But maybe I’ll peek a little, because I do have one main issue in this episode, and it’s the way Jae-kyung shoulders the responsibility for Jan-di and Jun-pyo’s continued romance. Let me make clear that I totally get that in the manga, Shigeru is the one who stops the wedding to spare Doumyouji the consequences of backing out himself. However, here the lead-up has been different, and therefore the way this unfolds puts a different spin on events, and it’s one I don’t like. Without making further comparisons to Hana Yori Dango, I think it’s problematic (or just frustrating) that Jae-kyung’s actions are the reason Jun-di get back together. Jan-di had her chance to tell Jun-pyo not to get married — the least provocation would have been enough to get him back — but she didn’t. Yes, she was kidnapped so who knows if she would have acted eventually, but I’m putting my money on no. She would have sat back and let her Grand Love marry someone else, and then moped for the rest of her life about it like some whiny martyr. Jun-pyo, to his credit, tried harder, and I’m not sure you can blame him for walking down that aisle after Jan-di failed to respond to his last-ditch plea. Furthermore, I think there’s a good chance that if Jae-kyung hadn’t spoken up, he may have found himself unable to take his vows. Fortunately for him, he didn’t have to find out, thanks to Jae-kyung. And lastly, I know a lot of people are dissatisfied with Jae-kyung the character. I agree that her arc was waaaay too long, and she never should have been given such a huge presence on the show. I’d have preferred some of the other guest players to be given a longer run (Haje, for example) and hers a much shorter one, to feel more balanced overall. But, in her defense, I think that the actress Lee Min-jung probably played this character as well as she could be played. In the hands of anyone else, I think Jae-kyung would have been even worse, and supremely irritating instead of just mildly so. Thanks to her bright effervescence, Jae-kyung came off as flawed and human — and yes, very selfish — but she also had some depth, which I appreciated. Still, thank goodness that’s finally over! I was afraid I’d be burnt out on this drama at this point, but thankfully I’m finding myself catching a second (or third?) wind in this last stretch. I’m staunchly spoiler-free (which is becoming SO FREAKING HARD to do these days, curses be to the Internet! ), so I’m only speculating when I predict we’ll probably have one big storyline and perhaps a minor one left in the remainder. Bring it on! finally! thank you! I have been waiting for this since this morning!!! Thank you!! dying to read it! Although I'm getting honestly tired with Jandi. At times although I love the pairing, I wonder WHY are they together!? Jandi hasn't done much (she fits Jihoo more) and what is it that Junpyo is in love with her (aside from "experiencing commoner life.." because he could just be happy having a friend whose a commoner. But why LOVE? I'm not smart in figuring these things out.. so I'm completely clueless on why they are in love with eachother or why Junpyo's love with her is so desperate. I'm happy it's ending, but I'm terribly sad. gah. And the last scene... so cuuuuuuuuuuuuuuuuuuute! Just wanted to say that I like the dance version of todays song better. Awesome recap thanks! Though I have to say that this episode was a bit random at parts. To me it kinda felt like everything was kinda pushed aside and rushed a little bit cause from Jae-Kyung's exit it didn't seem like she REALLY had a lot of feelings for Jun-Pyo as we had thought before. Anyways, that just my thinking. But all in all LOVEIT!!! Really enjoyed the episode. Thanks. Can't wait for the next one tomorrow. When's the series ending btw? thanks sooo much for the recap! now i can get some much needed sleep. you must know you are simply the best at doing what you do, right?? thanks again! My goodness I knew Jun-pyo's dad had to make to make an appearance sooner or later. If my guess is correct and the man in coma is Jun-pyo's dad, then I hope he wakes up from his coma and gives Mama Kang a good kick in the head after realizing that Jan-di had been caring for him. OMG! I would just absolutely LOVE IT. The last few minutes of the episode was cute. It would have been cuter if the little kid had a parma hairdo as well. This drama is indeed fluffy but oh well...I am addicted. Not a bad Monday episode..could have been a lot worse. Still a Jihoo-Jandi supporter. even though this epi has lovely JP and JD moments. "He grabs her in a relieved hug, and I can’t help thinking she doesn’t deserve this, seeing as how she put up no fight and hasn’t really earned his devotion. Still, the key to enjoying what follows is to accept their happy reunion, so I’m doing my best to let this point go." On the contrary, i thought Jandi totally deserved the hug after all that she has been through for GJP. Her response was spot on as there was nothing else she could do. It is up to GJP. GJP HAS TO MAKE THE DECISION TO MARRY JK OR NOT. Jandi will not plead, grovel or beg - not her style. Still clinging on to that little bit of hope that Jihoo will come up tops. The way he looked at the star necklace - think he would very much want to throw it away - somehow the necklace always finds its way back to him - to pass it back to Jandi. Aye..
Dramabeans - cannot believe you managed to steer clear from the spoilers! It is very hard to avoid - doesn't help that my will is weak...looking forward to your recap after tonight's episode! Thanks as always. I love you. It is so nice to know there are people out there who support the Jihoo-Jandi relationship. I'm amazed that you have remained spoiler-free... I haven't! And I'm kinda regretting it and also at the same time not. I'm torn because I want to know what's coming up but I also want to be surprised too. Ahhh the dilemma. Also, I appreciate the fact that you're letting some inconsistencies in the drama slide. BOF is nearing the end so might as well try to enjoy it as much as possible even with some of its problems! Anyway, back to the drama... I don't think that Ji Hoo made that confession to Jan Di by reading from the poetry book. I saw on soompi that what he said and what the poem was about were completely different things. He was really speaking from the heart. Poor guy... he's going to be rejected later. I think the reason that Jan Di didn't tell Jun Pyo to not go through with his wedding because she didn't think she was worthy of him giving up that just to be with her. 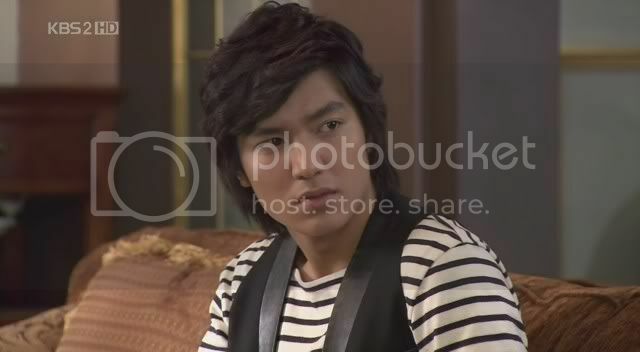 Even at the resort, she asked Jun Pyo why he picked her even though she had no fortune, not pretty or fame to her name. Do you think they will still do the amnesia arc? Gawd, I hope not! I hated that in both the taiwanese and japanese versions. as much as I got really burnt out from watching it, I'll have to say, I'll be dreading next week when it means it's all over! poor Ji Hoo... his feelings are becoming overwhelming with jandi in his house. =\ poor guy. I loved the part when he was reading that poem to her (while she was falling asleep) & he read "I love you" and you can tell he meant it but she didn't hear =(. Still on the Ji Hoo/Jan Di ship... I think Lee Min Ho is a great actor and everything but just character wise I like Ji Hoo better for Jan Di. There's never enough Woo Bin though. Like you, to echo you, I am glad that JK is gone, although I think she is a great actress and absolutely gorgeous, and I hope she has a lead in a show in the future because I liked the way she portrayed her character. I would be fine with JK taking on the burden of breaking off the wedding IF THE SHOW HAD NOT EMPHASIZED JP's spectacular lack of a back bone. Because JP was completely without a pair for eight episodes, JP and JD's reunion feels more like a lucky happenstance (lucky that JK has the pair that JP doesn't). The problem with keeping JK in the show for so long, and by having JP spend so much time with her, shopping, playing video games, kissing, etc., is that I just don't BELIEVE that JP and JD love each other. I would even argue--within the context of this drama--that JK shows more love for JP by setting him free than JD has throughout the show. I felt nothing when JP and JD were together--oh, have times changed--I watched their second kiss (on the swings) a million times. This time, their pairing did nothing for me. I just don't see why these guys are in love with JD--the character seems totally depressed (like clinically depressed). I feel really bad for JH. He really loves JD--in a way that seems more intense than I remember from HYD. Anyway, I will miss this show once it ends! It was a fun run and great escapism. 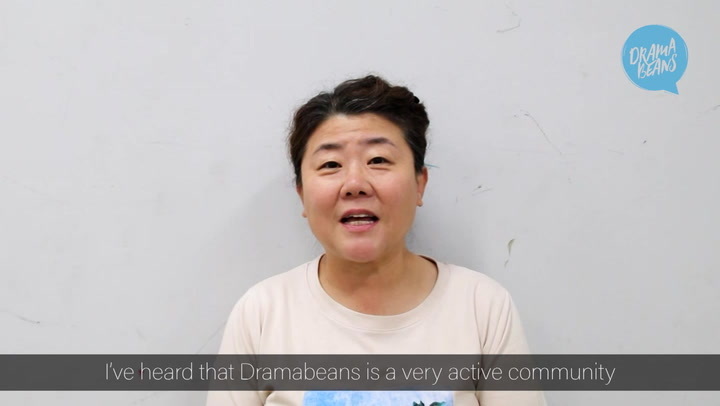 Thank you, dramabeans, for the blog and your this space for some fans to gather. like why does Ga Eul like Yi Jung? he's been such a loser these past few episodes. why does JD like JP? JH is just so much nicer and better for her. I can't believe JP was actually going to go through with the wedding. That's just so un-tsukasa like. 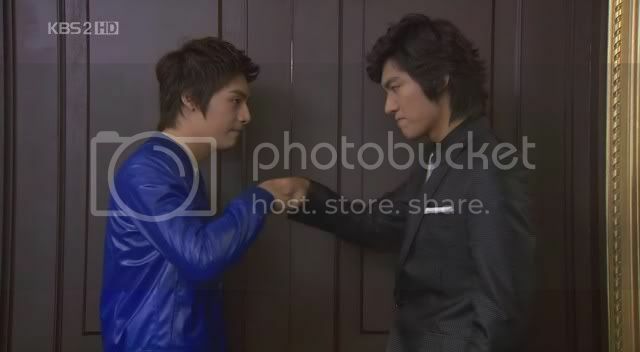 I'm actually hoping the rumored JH-JD ending will come true. That imo would be the best ending for this drama. Ji Hoo is getting on my nerves. He's had way too much screen time as it is but if I have to see him being perfect and pining till the very end, i'm prepared to skip right over his scenes. Glad to see JunDi having some real happy moments together. I wonder what their sleeping arrangements were like. They're horny teenagers so obviously anything other than chaste kisses are SO out of the question lol. Way to be realistic KBS! I agree with you but am pissed that you actually dissed Ji hoo. He is a very important part in this drama and without him Jan Di and Jun Pyo probably wouldn't be together. I'm glad they're back together. But it obviously seems this is only the calm before the storm. I can only hope that Madam Kang won't use a cheap overused tactic to attack Jan-di this time. I think the guy Jan-di's caring for will be Jun-pyo's dad too. I've actually read the manga and watched the dorama version, and remember that nice old guy that helped mean Domyouji's Mom finally give in? I think it'll be him in this version. @Jan-di's face at the beginning. She did seem angry, but maybe it was because she was angry at herself? Because, like Jun-pyo, it's her good side that keeps her from getting what she REALLY wants, and there are just those moments when you wish you weren't really such a good person. BTW, I can't seem to be able to download the file. It looks like it's deleted from MediaFire or something. Please do fix it. Even though I'm glad Jun-di are back together, a part of me is sad that Jae-kyung left..I thought she was a pretty cool character even thought she was really selfish at some parts.. I do agree that I would have loved to see Jan-di fight for Jun-pyo at that moment. However I also understood why she didn't speak up and ultimately faltered. In the end her insecurities trumped over her desires. She even asks Jun-pyo why he still likes her when she doesn't have much to offer. There is also the fact she doesn't know exactly why Jun-pyo broke up with her, the kiss she saw between him and JK, etc. I guess the same could be said for Jun-pyo. He could have fought harder and objected to his engagement. I'm sure he would have taken a much drastic measure if he really knew all the stuff Mama Kang had done to Jan-di behind his back. We all know that Mama Kang certainly did not keep up her end of their bargain (on promising to not hurt Jan-di). It's the fact Mama Kang is such a presence and has managed to effectively derail whatever happiness that Jun-pyo and Jan-di have built, over and over again. She's the wrecking ball to their foundation. Once Jan-di finds a way to get her approval I'm sure it'll be a much smoother sailing for our love birds. Obviously Jan-di still cared and missed Jun-pyo very much. The smile that finally surfaced when she was hugging Jun-pyo. It felt like for that moment all the troubles, their complications, everything just went out the window. It was her and Jun-pyo relishing that moment. My favorite scene besides the zoo scene in this episode. Thanks for the recap. I really appreciate it. I just love Ji Hoo and Jan Di. I wish they could end up together. However, like we all know, the Jun-Jan will be together. I am just wondering that when the grandpa said that Ji Hoo and Jan Di are not suitable together, is there a legitimate reason for it??? Can anyone clarify it ? I wonder why Grandpa tells Jihoo that he is against JiHoo and Jandi getting together.... didn't he say that he wanted her as a grand daughter in law? And the last one I really wish they did not copy from the manga at all as it is superfluous as it is in the original manga. oh dear, just love how Jae Kyung cancel the marriage! However, I simply wonder why Jun Pyo is not brave enough like Doumyouji who initially wants to cancel the marriage, nor when Jan Di is homeless, Jun Pyo is not the one who brings her to his house (as Tau Ming Se did in Meteor Garden). but anyway, I JUST LOVE THE STORY!!! THANK YOU JAVABEANS!!! Thanks so much. I enjoy reading your BOF recaps every week. btw.....seulmate IS DRIVING ME CRAZY....I practiacly forwarded every part that was about ga eul and mystery woman (can't remember her name)......it's too tiring. "There’s nothing more laughable than seeing a drama depict mega-rich characters when everything actually looks quite shabby, right?" This made me LOL. Because that's EXACTLY how I felt about MG after watching HYD and BBF. No offence to MG (I LOVED that show), but it really pales in comparison vis-a-vis the "richness" and utter extravagance of HYD and BBF. it`s hard to believe that the same band who made our ears bleed with PARADISE came up with today's song. Ever since I saw episode 19/20 i searched all over the internet looking for it - and alas! when the latest OST was released - i fell off my chair screaming. yes screaming, out of joy and confusion. definitely a WTF moment from me. t-max? yes, t-max. it`s such a shame that the first song we had to hear from them was such a ________. ps. i actually suffered from paradise withdrawal the past few weeks. it was scary. but then again, this show itself is scary - forcing you to watch mindlessly in order to enjoy it. `gah. i'll miss this show. To anonymous, I don't think Jandi and Junpyo spent the night together. She is not that kind of girl, and Junpyo isn't either.. It is totally out of character for them. yeah i feel that too. compared with makino, jandi is just ordinary girl. i dont see her fighting, positive thinking, optimism commoner's life like makino had.sorry to say.coz korean version did not stick with the character of makino and domyoji like the other have. i dont see jandi's fighting. i dont see she deserve much love from jun pyo. 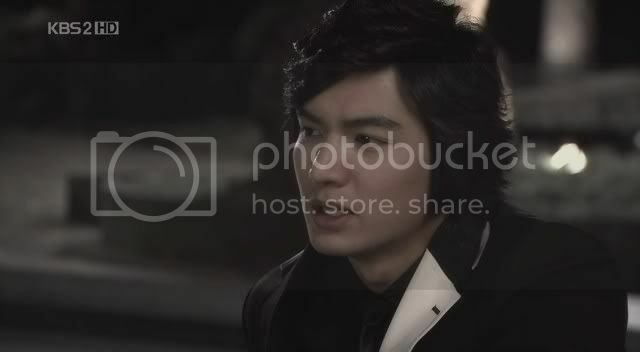 and jun pyo he's not evil after all.that was counfused me.coz, he should be evil rather than childish. and he must be more human becouse of jandi. i dont see his change between the evil jun pyo to more human jun pyo coz from the start..once again he's not evil after all. 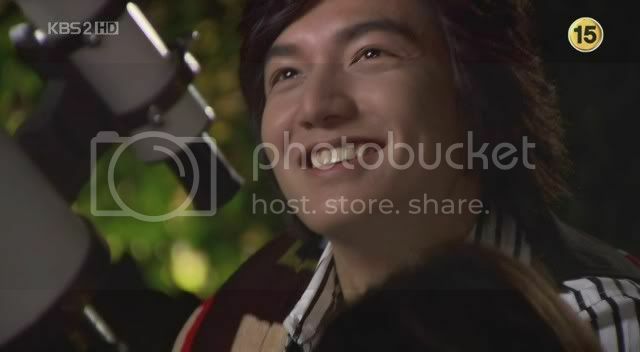 jun pyo he doesnt look like tough guy like domyoji HYD or Dao mIng Tse MG. he did not fight for his love. so as jandi. i'm so dissapointed about these two character eventough i enjoying the show. it's like jun pyo-jandi should be together.period. hehehe!!! the end is near!!!! it's getting quite obvious how the ending will be... but then i might be wrong! cant wait!!!! nice song by the way! Ji-hoo.... : ( well..., im available... LOL!!!! I came out of this episode feeling sorry for two people: Ji Hoo and Jae Kyung. Overwhelmingly more so for Ji Hoo. The fact that he now has to live under the same roof of the girl he loves but can't have is too cruel for the poor boy. Miss Scriptwriter must be the biggest HyunJoong fangirl. Like, seriously, you're going to put the cutest Ji Hoo-Jandi scenes AFTER she gets back together with Joon Pyo?! Do you want the rest of us Joondi shippers to jump ship, too? Joon Pyo at the wedding pissed me off to the point where I wanted Jandi to push him away when he hugged her on the yacht. I mean, Jae Kyung asked, "Is there anyone else that objects?" Everyone else on our cast objected, why couldn't he?! But he definitely redeemed himself at the zoo. I was squealing with delight watching him compete with the little boy for Jandi's attention. Min Ho with kids is just hot. I'll deeply miss "BOF" when it's over. What am I going to look forward to on Mondays and Tuesdays now? Thanks as always for your detailed synopsis and witty analysis, javabeans! come on, doesn't he (jun-pyo) have casual clothes to wear outside? why does he always have to wear a darn suit? First and foremost, doesn't Lee Min-ho look exquisite in the tuxedo? Plastic surgery or not, he looks effin' hot. Now, on to more "serious" talk. 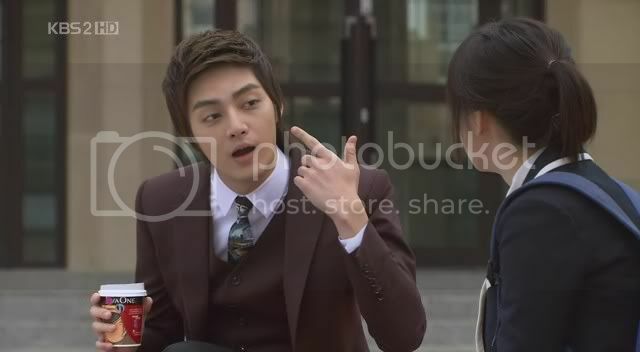 I had a problem with Jun-pyo not doing anything before Jae-kyung spoke up. I wondered, would he have? Because of that, I wanted reassurance from him about his feelings for Jan-di so I felt better when he said the L word. But I agree with you about Jan-di. It was strange how she didn't do anything. She's letting people dictate her life. It's like when someone says, "give me that," she goes "here." When the same person says "here, take it back," she goes "okay, thanks." And the funny thing is, she never listens or agrees with Jun-pyo, the one person she should take into consideration. It is indeed strange and out of character. As much as I dislike Jae-kyung, it was somewhat sad to hear her say “you don’t know how much I’d hoped that the JJ stood for Ji-hoo and Jan-di." And isn't it a little too much of PD Jun Ki-sang to make Jae-kyung the person who arranged the hotel room and a romantic candlelight dinner for Jun-pyo and Jan-di? The woman had just let go of the love of her life at her own wedding. It was enough proof that she is a kindhearted person. There was no need to go further than that. The candlelight dinner date was ehh for me. It was too formal and somewhat awkward. The only highlight was of course when Jun-pyo said "I love you" to Jan-di. I saw it coming a second before it did and gasped anyway when I heard it. It was very sweet. On the other hand, I really loved the zoo date scene. It brought out more of the bickering and bantering Jun-Di couple we first fell in love with. I always enjoy watching Jun-pyo showcase his kid at heart personality. And how cute was the little boy!? They all looked so adorable together. YAY! more Woo Bin & his english. at least the writer is somewhat trying to give him MORE screen time with LESS ridiculous lines. 1) ji hoo and jae kyung's conversation. the way she said "you don't know how much i wished that J and J meant ji hoo and jan di." broke my heart. now that they're not messing with my ship, i've come to appreciate the full gravity of what jae kyung did and what ji hoo is STILL doing... i wouldn't wish their position on anyone. i can't believe that they have to not only stand by and watch their happiness, but also cooperate in it-- because they MUST, and they want to-- it's the only way they see the one they love be happy, and that's to let them love someone else. it's starting to feel like throwing a dog a bone, and the dog settling for any scrap he gets. just like jae kyung settling for the shoes she knew were jandi's in the first place. at least she should have the shoes that made her believe that things like LOVE exist at all. i think ji hoo's realizing the patheticness of the situation as well, but it's conflicted with the truth of he HAS to cooperate in it, so nuts to that. like i said, i wouldn't wish their position on anyone. 2) jun pyo's story about the telescope. i LOVE that his dream is "to not make promises i can't keep". it speaks volumes of the sort of man he is, why he fights for what he wants the way he does, why his first love is this poor girl-- he never saw the poor part of her, he only ever saw her character and her integrity. she's the one who'll let him have that dream. and with her warmth and her compassion, she's also the one who'll let him LIVE it. 3) jun pyo, jan di and chan at the zoo. this feels like a throwback to old times-- his boyness coming out. the way he fought that kid for jan di's attention made it seem like she was taking care of TWO boys (kyaaa~~) .. but towards the end of it, when he started coming around and playing with the kid too.. you get that the reason he doesn't share is only because he's been starved for life situations where he has to. but you see that given the opportunity, he will see the merit in these and he will adjust, share and compromise. like you said in one post before, i like how in BOF, it doesn't only look like they've grown up, it FEELS like they've grown up also. 4) lastly, i liked that in this version, ji hoo falls in love with jan di, AND jan di knows it. and she appreciates that there's a line that musn't be crossed because she knows the delicacy of a situation where you used to love someone and now love his best friend, and his best friend loves you too, only he loves you also nowand while you do still love him, you love him only as a friend. when she reflects on that poem, i like how she has powerful memories of what ji hoo means for her too. it's what keeps her choice well delineated. i also feel sorry for jihoo, i gotta admit, i wanted him and jandi to be together, they just seem so good. he's always there for her and she brings him out of his shell. its kinda perfect! but junpyo all the way! Thanks for the recap, and kudos to you for not having seen the spoilers! I gave up long ago haha! I know Junpyo has been dissed for his lack of a backbone. But let's remember that he's a young guy with no real power/money apart from his family, which is why his mum's bodyguards are always able to catch him and bring him back. It's not just about him not having the courage, there's so little he can do in a practical way to resist his mum's orders. And neither does he want Jandi to come to any harm. And also, I believe he does care about the family's business, more for his father's sake, and has no desire to cause its downfall. Also, I believe that as much as he does not wish to marry JK, he does not want to leave her at the altar, which is why he knelt before her the night before instead. i disagree with you about jandi's bitchy expression at the beginning. i felt her expression was more of an internal frustration with herself because, regardless of how "tough" she may seem sometimes (a looong time ago), she's very insecure. however, i do agree with you that she didn't deserve that hug because she hasn't done anything for the relationship. anyway, while i was watching the airport scene, i thought, wouldn't it be funny if jaekyung got a spinoff? she's a fun character and i'd be interested to watch. then again, this isn't american television. IMHO - My take on Grandpa's comment...i always thought he likes to express how he truly feels in the exact opposite manner i.e. in actual fact - he approves of Jandi and that Jihoo is right for her. I am not surprised that they knew each other given that he is the ex President and she is from the most prominent family in Korea. Funnily - everyone who knew Mdm Kang from the past (eg. grandma/sunbae, grandpa/dr yoon), has commented how much she has changed. 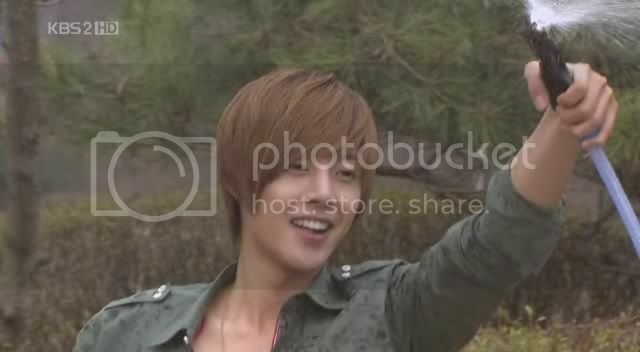 Mr Jung - he is my favourite guy after jihoo. Most subtle but totally effective.